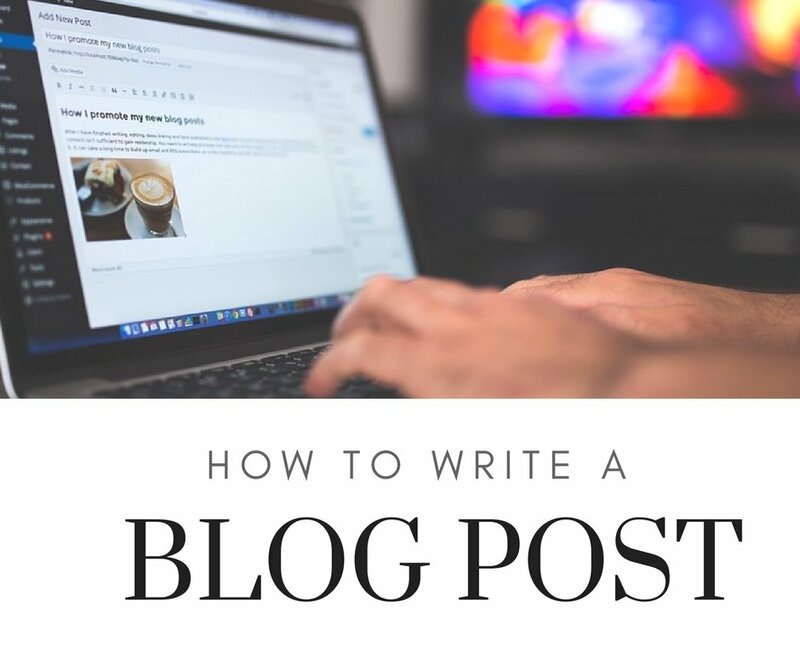 Writing a blog post might seem easy to many, but writing an effective blog posts isn’t really as easy as it sounds. 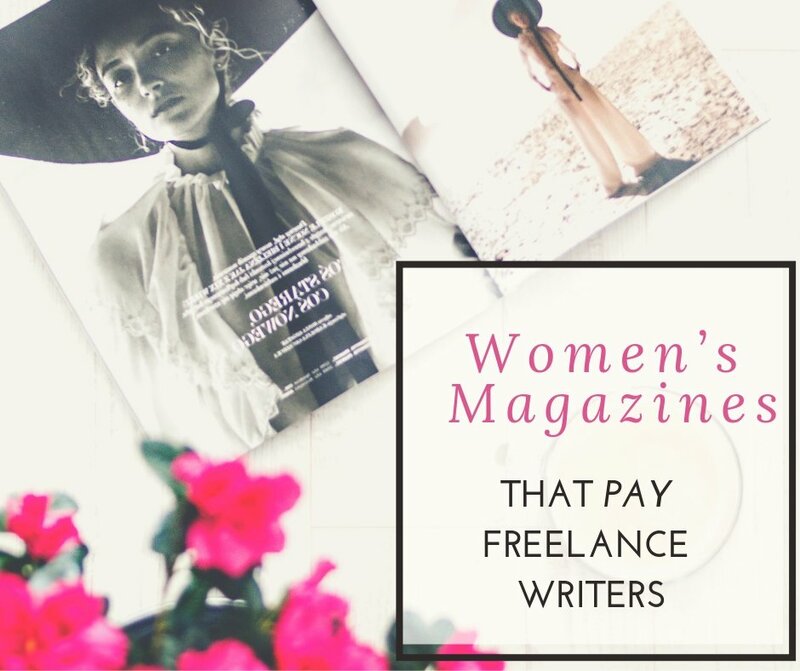 It takes a lot of blood, sweat, and tears to create the perfect blog post that doesn’t just get traction from readers but also ends up getting you more freelance writing clients. Personally, I have written some blog posts which took me days to complete, but once they were finally published, I was nothing less than proud and the blog posts ended up getting me a number of clients because they loved my work. If you are a new freelance writer and you are still not sure what really constitutes a perfect blog post, then here is a complete guide for you. 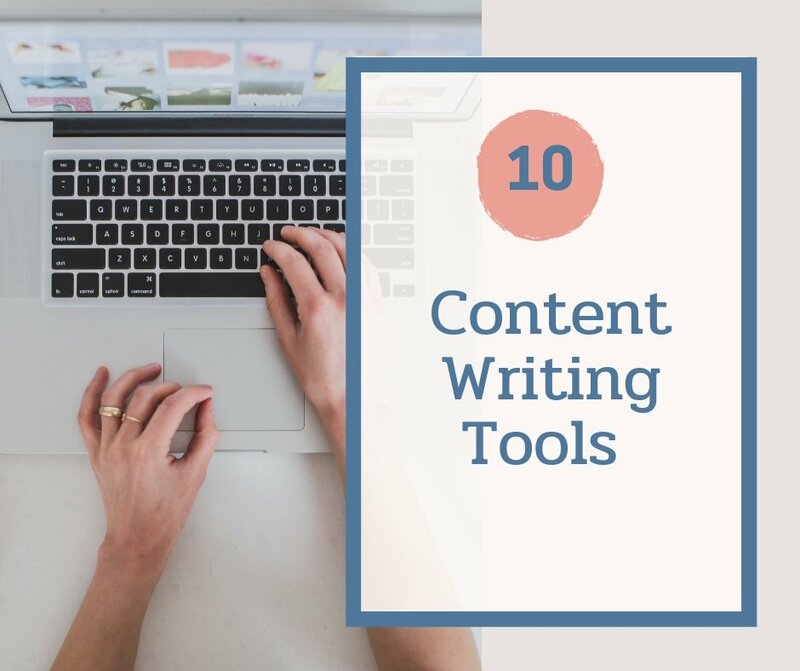 At the end of the article, there is also a checklist that you can download to always ensure that your blog posts have everything needed and you haven’t forgotten anything. Most new freelancers struggle to find the right topics. They often feel more comfortable when a client provides them with a topic. 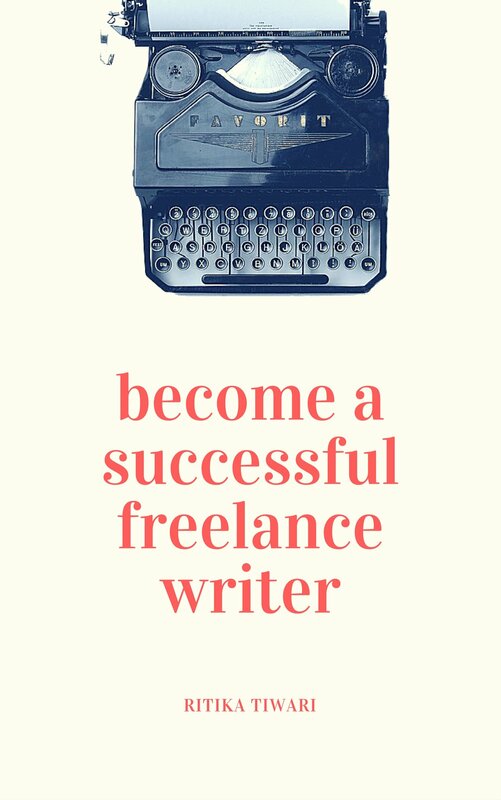 But, I feel every freelance writer should be able to not only write meticulously but also create a strategic content approach. Take the category you are trying to focus and research it thoroughly. From the main topics to the sub-topics, make a list of every little thing that you should be covering in the category. Find the age group of your target audience and why they are interested in the niche you are writing in. Understand their main concerns, their biggest challenges, and every time you come up with a topic, ask yourself – Does it focus on the target audience for the website? You can also use Google search results to find long tail keywords. Just type one of the main keywords that you would want to focus on, like ‘creative writing courses’ and scroll to the end of the page to find the ‘Search results related section.’ All the keywords here are essentially long tail ones that you can target and create a topic around. One of the most effective ways to find the right topic is by seeing what your competitors are doing. But don’t just re-write a blog post by one of your competitors as it won’t serve the purpose. Instead, ask yourself how you can approach the same topic in a better and more exhaustive way. I have seen writers who research as they are writing the content, but take it from someone who has made this mistake many times – Research first, write later. Researching first allows you to organize your content better and create a structure for the article even before you have started. And most importantly, it helps you write faster since you don’t get interrupted after every paragraph to do research. Add working subheadings to your blog post to visualize the content flow. If you are doing a list-type piece, then list down all the points and how you want to approach each one of them. Note: Sub headings are crucial for blog posts because they make the content more organized and easily readable. Take this blog post for instance, if I just wrote a big blob of 2000 words without any subheadings, you would be confused about what do with it. Instead, I have used subheadings and sub-subheadings to break down all the content. Have you ever written a complete article and then realized you are either too far from the word limit or too ahead? That’s probably because you didn’t take word limit into account before writing. You need to be smart here and do some maths. When you create the outline, also write the approximate number of words you will write under each subheading. Also, count the number of words taken by introduction and conclusion parts. So, if you are doing a list type article with 5 subheadings and the word limit is 500 words, then you can first take out 100 words for introduction and conclusion. So, you are left out with 400 words. In 400 words, you need to write 5 points, so each point will have 400/5 = 80 words. Of course, this is just an approximate word count, you can move it around a bit. But this will give you a pretty clear idea about how much research and content you really need. It’s important to take your time with the introduction as it should be able to lure readers into reading the whole piece. If it’s a small article, you can write the introduction first. But if it’s a big article (more than 2000 words), it’s always better to write the introduction after you have written the entire body as you will be able to better skim the different solutions you have added in the article. Okay, so now it’s time to write the entire article. If you have done your research and already created an outline, then I am sure it will be much easier for you. Go back to the research you did and use it in your content. Instead of keeping research and article in the same document, you can use tools like Evernote which can clip an entire web page. This way, you will also be able to access previously researched web pages even when you are offline. Always use studies or surveys to back your claims if you can. Always link back to these studies so that if a reader wants to further read on it, they can. The conclusion should essentially include a takeaway and a call to action (CTA). Before you start the editing process, you need to take a break. At least 30 mins break for small articles and a whole day’s break for big ones. That’s because if you immediately start editing your article after writing, then you won’t be able to identify your own mistakes. You need a fresh pair of eyes for this. 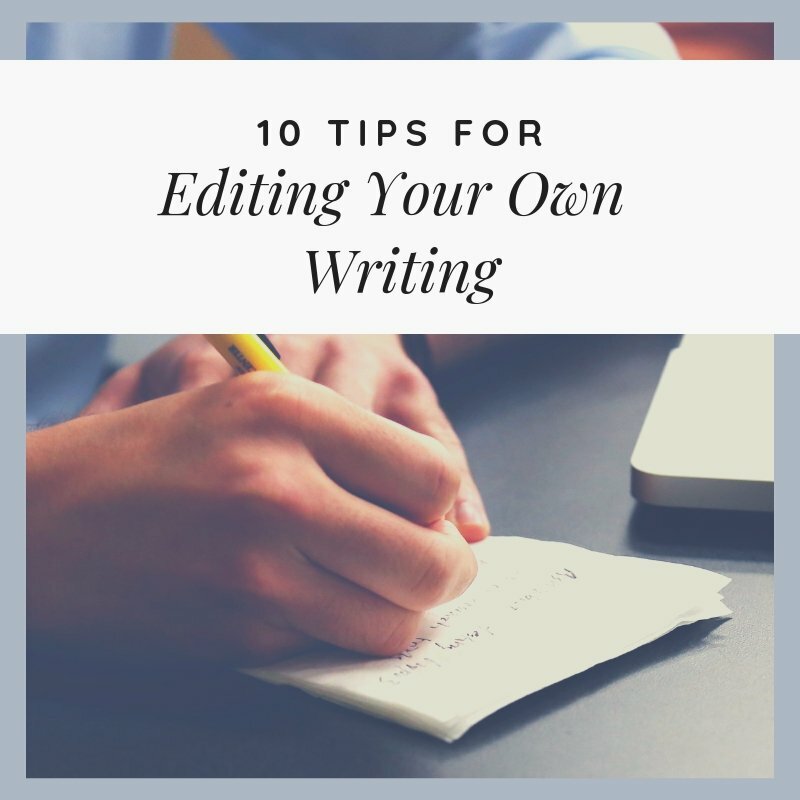 You need to edit like an editor and not like a writer. The article should be in the right English – US, UK, India, and most importantly it should be uniform. This is the biggest mistake I see writers make. In the same article, they use some words in US English and others in UK English. That’s wrong. 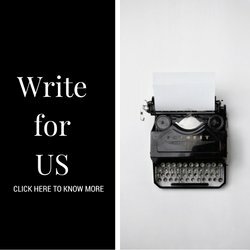 The entire blog post should be uniform with the same English. If you will be uploading the blog post to WordPress or or any other platforms then formatting is a must. To add subheadings in Microsoft Word, click on the Home tab and you should be able to see options on top. 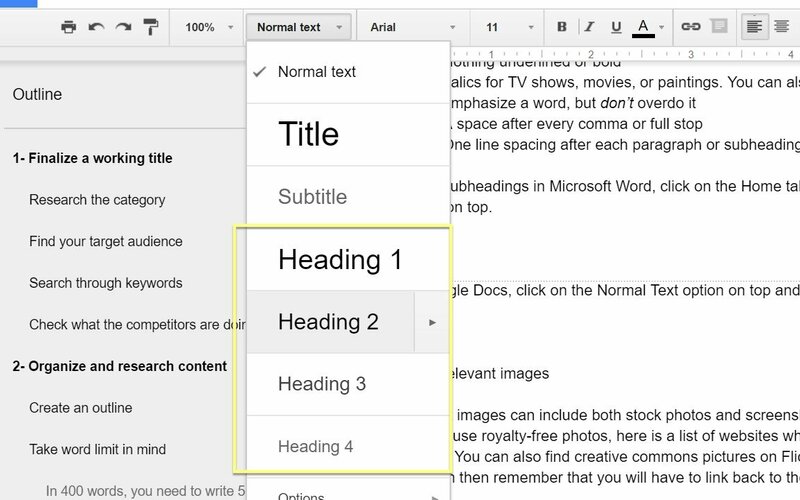 For Google Docs, click on the Normal Text option on top and a drop down will open. Relevant images can include both stock photos and screenshots. For stock photos, its always better to use royalty-free photos, here is a list of websites where you can easily get royalty-free pictures. You can also find creative commons pictures on Flickr or Google Search, but if you do use them then remember that you will have to link back to the source of the image. If you are using screenshots, then use a tool like Tiny Take which easily takes screenshots and also allows users to add arrows, boxes, and other annotations. With everything done, it’s time to rewrite the title and subheadings into more actionable content so that the readers get exactly what you are covering in the piece and intrigued as well. The Coschedule headline analyzer is a pretty great tool for that purpose and I highly recommend it. Yes, search engine optimization for blog posts is just as important and it shouldn’t be forgotten behind. The title which will be displayed on search engines. It is usually the same as the main blog post title. Meta description which is displayed on search engines right below the search engine. Make it good and also include the keywords. Add relevant links wherever necessary and backlinks to some of the old blog posts as well. As you can see, there is a lot that needs to be done to craft the perfect blog post. But you can also reap a lot of results and future opportunities with a well-researched post. Yes, I know, its a lot! Lucky for you, I have created the ultimate checklist which will ensure you never forget any point while writing the perfect blog post. Wonderfully narrated checklist and a definite guideline for a novice. Again, a testimony of a seasoned content writer. Thanks for the article. Wonderful. Thanks for generously sharing your knowledge.